Expect a full explanation tomorrow! 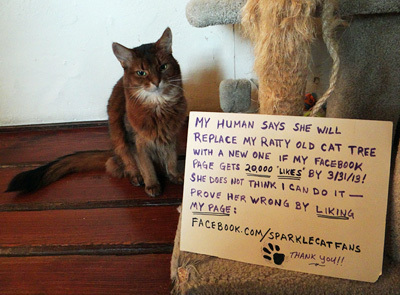 Keep my paws crossed that you will get 20.000 likes by march 31 ! Yikes on the Likes Sparkle! We don’t do FB, either, and we, too, think our “voice” should count! **snort snort** We stopped by and liked your page. If we could do it multiple times, we would! We can’t believe the things peoples will do! We aren’t on FB, but the mom has been thinking maybe. Of course, she has been thinking about it for about 5 years. Oh dear. I’ll have to start spreading the word. Already liked on fb a long time ago. Hoping this will 😛 count! Hoping you get your new, snazzy cat tree! Sparkle, I just don’t think that’s right. Especially since we don’t do Facebook. So I think this LIKE should count. P.S. You look kinda crabilated. I AM kind of crabilated – I shouldn’t have to work for a new one. WHAT??! After all that work to get it that way???! Criminy. What is she thinking??? !